This evening the Eiffel Tower was half hidden in the mist, as it often is in November. The sky here is white like this probably half the year. It must confound people from sunny countries. But I like it because the light is so changeable and beautiful. Every Thursday night in Paris, the grands magasins are open late, till 21h/ 9 p.m.; so I decided to go to the Bon Marché with one of my family to do some early Christmas shopping. The Bon Marché is the quietest, most bourgeois, and oldest grand magasin, slightly off the main tourist track, and blessedly less crowded at all times than Galeries Lafayette and Printemps, or BHV-- where I have actually seen firemen standing at the bottom of the escalators pushing people forward-- madhouses that I hope to avoid completely this year. The Bon Marché had recently put its Christmas decorations up and there was a line of children along the windows outside. Inside, it smelled nice and we browsed around, buying one or two things and enjoying the holiday atmosphere without the frenzy. We heard classical music as we walked around, but suddenly there was applause. It was live music. We went to look over the balcony-- the Bon Marché is built around a great central space with escalators in the middle of it. 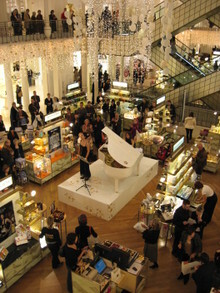 On the ground floor, a quartet of classical musicians, all young women, were playing Mozart, as young men in black, with "Christmas Staff" written on their backs (en anglais dans le texte), passed out champagne on trays to customers. We rushed downstairs, but the champagne servers appeared to sense our presence and disappear as we got closer, only to reappear off in the distance. It seemed that everyone in the store had a champagne glass in his or her hand, except us! Finally L chased one server down to his lair somewhere near the Shiseido stand, and snagged two glasses ("It's good champagne, Moët") and we toasted Christmas and leaned against the counter, spraying ourselves with perfume samples as we listened and drank. The management had thoughtfully provided chairs for the older customers, who were all nodding and smiling at each other and us. "C'est très sympathique, n'est-ce pas?" It was such a pleasant evening. Even all the salespeople were in a good mood. Although they were en principe not allowed to drink while working, I saw quite a few with glasses in their hands, standing behind columns or peeking around the corner and looking very cheerful and conspiratorial. In the "youth" part of the store, a Japanese designer, Tsumori Chisato, was signing her new book, a mellow band was playing and there was more champagne. "We have des invités de qualité this evening," I heard someone say [quality guests]. We tried in vain to recognize the glamorous-looking fashion people standing around. My family member was starstruck and got Tsumori's autograph. Then we descended to the toy department, where I was heartlessly prevented from buying a Pirates of the Caribbean talking skull alarm. It's true that I don't actually need it. We came home in such a good mood. Christmas shopping like that--any time! I went to the Bon Marche for the first time the other day. It was Saint Catherine's day (I think that was it, it may have been another saint), and there were saleswomen in elaborately decorated silly hats handing out candy to the customers. They were all giggling and admiring the shoes, and picking candy out of their own baskets as well, and seemed to be having a great time. Vive la France! I must have crossed paths with you! I was there as the musicians were setting up and (foolishly) didn't stay for the entertainment. I've lived around the corner from Bon Marche for 4 months now and just last week discovered the bookstore/papeterie in the sous-sol.